Donald Trump appears to be adding a new line to his collection of signature insults, a list that includes "Low-energy Jeb Bush," "Lyin' Ted Cruz" and "Little Marco Rubio." 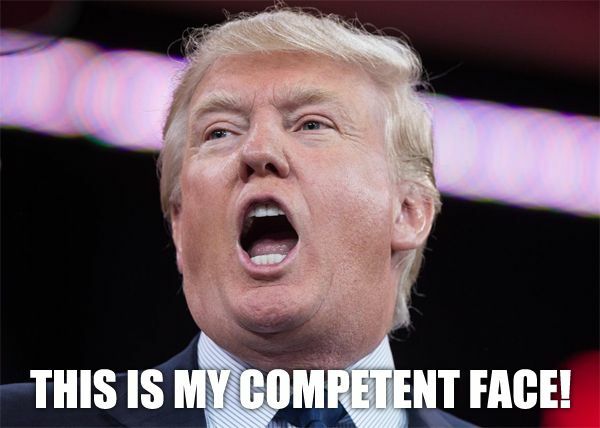 Within the past 24 hours, Trump has unveiled a new moniker, this time aimed at the Democratic front-runner: Hillary Clinton is incompetent. ..."I think people will see I'm much more competent than she is," Trump told Bloomberg Politics' "With All Due Respect" in an interview conducted Tuesday but broadcast Wednesday. "I think I'm much smarter than she is. I think I'm much more competent than she is." Trump used the same phrase during his appearance on Fox News' "Hannity" late Tuesday. "Incompetent Hillary doesn't know what she's talking about," he told host Sean Hannity in a phone interview. "She doesn't have a clue. She's made such bad decisions." Hahahahahahaha! Donald Trump thinks he's much smarter and much more competent than Hillary Clinton. Hahahahahahaha! Yeah, that's a real keeper, Trump. You go ahead and make this election about who's more competent—you or Hillary Clinton. We'll see how that works out for ya. I mean, really just go for it. Frankly, the very idea that you want to make competency the centerpiece of this campaign is indicative of how competent you truly are. Bring it on, Competent Donald! Take the competency game straight to Incompetent Hillary's face! Because you are, FOR SURE, much smarter and much more competent than former First Lady, Senator, and Secretary of State Hillary Clinton. I really couldn't approve more of this strategy.